The Redcoats are back, and they're going to party like it's 1775. They're setting up on probably the Charles Street side of Boston Common (where they were camped, from my scant research) from 3pm to 6pm today, and the reenactors are going to do their thing until Sunday afternoon. The John Powhida Birthday Party/Roast at the Middle East (Downstairs) is no longer $10, but The Marvels' Facebook says you can get in for free if you say "Jackchop" at the door... The music will rock, and it should be easy to roast Powhida. "Semi formal dress code encouraged." Have you wanted to get a tattoo, but don't want to spend a lot of money? This deal is WAY better than getting one in jail. The show's title is rather ambiguous, but that's cool. It's supposed to be a "survey of contemporary Boston art", and the refreshments courtesy of Narragansett. 'Nuff said. Here are some samples of the paintings, sculpture, etc. As if $5 wasn't cheap enough for a Friday night comedy show, there's an easy way for two people to get in for one low price: Grab a Weekly Dig before you go in, and rip out page #8. The ad in the upper right says just to mention it -- but you haven't seen the ad yet, right? You can go do something else by 9:30 or stay to dance with "The Pill" at no extra cost. 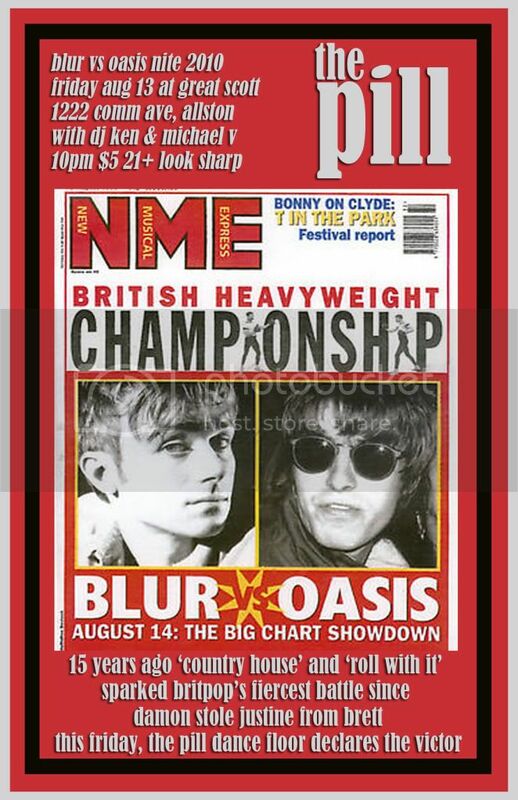 It would be a good night to hang around, because it's "Blur vs Oasis Nite". The great Willie Nelson is playing the big room tonight, so they put together a darn-fine, rootsy alt-country/Americana for the front room. 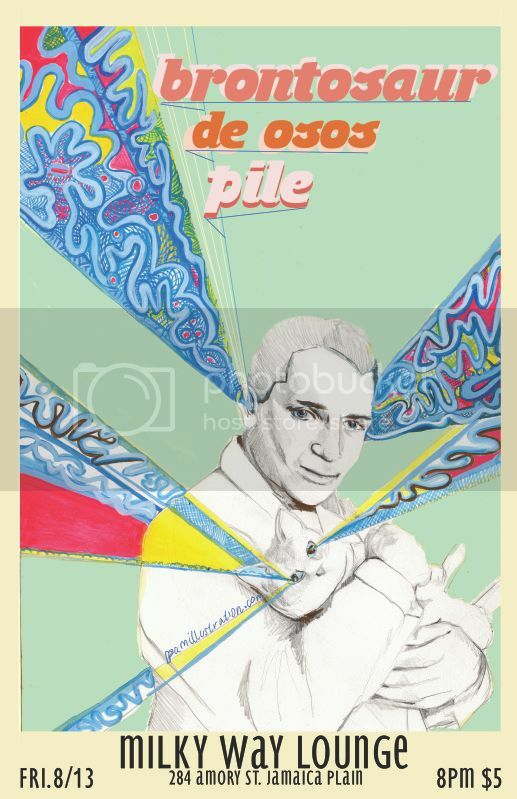 I bet Willie would probably enjoy hanging out and listening to tunes if he didn't have to smoke a big, fat doobie after his set. If The Mallett Brothers go on first and they don't float your boat, stick around 'cause Coyote Kolb and Brown Bird are excellent. Coyote Kolb is going to play an acoustic set, which should still be pretty deep and heavy. It's nice to see the Milky Way has started to book live music again on a regular basis. Let the HOB Front Room (above) be a lesson that it may not continue if people don't support the scene; they had original bands almost every night for a couple months, and now it's a few nights here and there. So head down if you're in the mood for tasty, twisted, ambitious indie-rock; go and dig the tunes. If you don't love The Figgs yet, you could start tonight by catching the guitarist and bassist of one of the great American rock bands. Then you should start with "Sucking in Stereo" then go in any direction from there. Mike and Pete will probably play some tunes from the new album they're recording too. Seems like a while since Superhoney hasn't played around in a long while. This may be a new beginning or just a one time booty-shaking explosion of funk-rock. It will be difficult to stand in place and have a boring time.